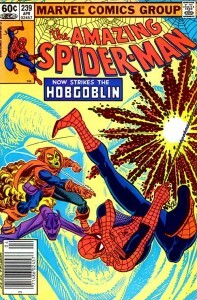 What’s so unique about Amazing Spider-Man #239 is how writer Roger Stern takes his new creation, the Hobgoblin, and expertly crafts the villain as a legitimate physical and psychological threat to Spider-Man, while also exposing the character’s vulnerabilities and weaknesses. In the 20 years of Spider-Man comics that preceded ASM #239, the new villain du jour was always looking to get their first crack at Spidey – to humble and humiliate (or kill) him. But Stern’s Hobgoblin is an entirely different animal. He spends the first half of the issue secretly robbing warehouses and factories owned by the former Green Goblin, Norman Osborn. Then, when the Hobgoblin is finally confronted by Spider-Man, the villain admits to himself that he’s not quite “ready” to have this fight. There’s a self-awareness and intellect to the Hobgoblin that is just not commonly found in the comic book medium. And it’s even more noticeable coming on the heels of an era where every two-bit, crackpot villain wanted to make a name of himself either by brazenly committing acts in public spaces (Mirage, Hypno Hustler and Mindworm) or charging like a bull in a china shop at Spider-Man in hopes of physically overtaking him (Green Goblin III, Boomerang and most pathetically of all, Big Wheel). I’ve never been a huge fan of the Bronze Age-era of Spider-Man (which I consider the period roughly between ASM #100 and #200 as a reference point) because of the wave of carelessly crafted villains thrown at readers in hopes that one of them would stick and become the next big thing. As a result, there are very few rogues introduced during this time period that could even warrant consideration on a “top” Spider-Man villains list (off the top-of-my-head I’d say Jackal and Tarantula were both good additions). 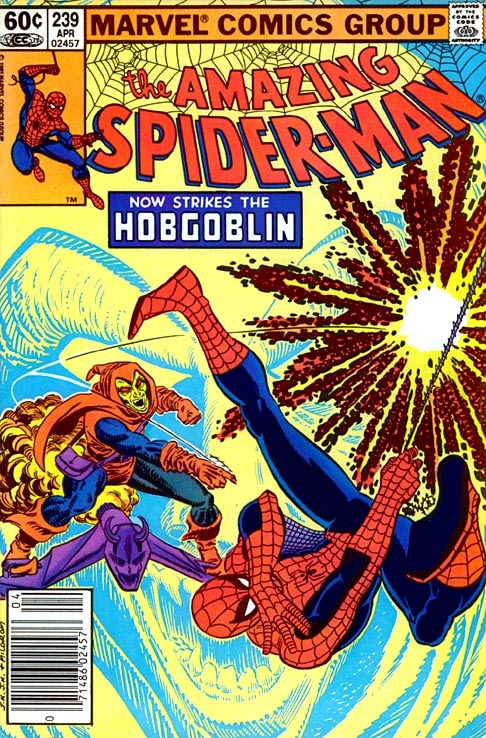 There’s a deliberateness to Stern’s Hobgoblin, and what makes the character, and this first arc such a triumph is the fact that the writer’s insistence to properly build this character rather than just shoot him to the moon without it feeling “earned,” doesn’t come at the expense of uneven pacing and the comic’s momentum. Stern’s slow-building crescendo is certainly aided by the fact that there’s a mystery behind the Hobgoblin’s identity is so closely guarded. 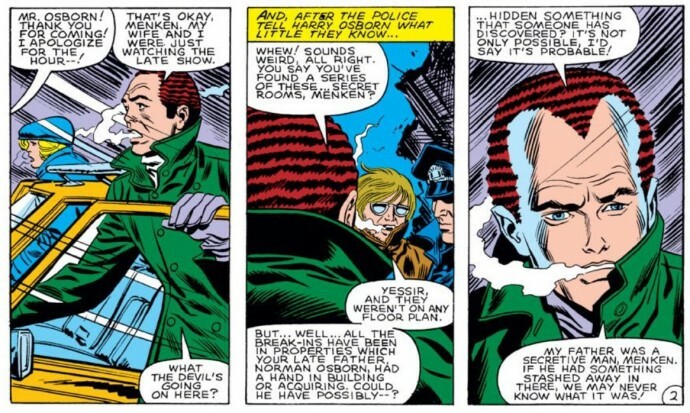 Harry Osborn is introduced in ASM #239 as Stern’s next potential red herring when he shows up to talk to police after another Oscorp facility is broken into (remember folks, Harry has to be suspect considering he followed in his father’s footsteps and became the Green Goblin in ASM #136-137). Harry has an alibi (watching the late show with his wife, Liz) but also expresses no surprise at the idea that his father had secret hiding places for Oscorp equipment (hmmm ….). In a neat bit of editing, after Harry’s declaration, we immediately cut to the scene of a shadowy figure (complete with trench coat and hat) reading about the Oscorp break-in on the cover of the Daily Bugle and chuckling to himself that he had made front page news. 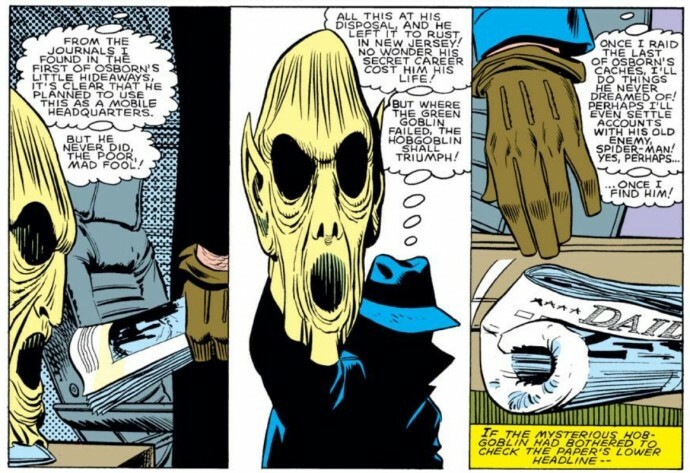 Every time the story transitions from a potential suspect to the actual Hobgoblin in shadow or in costume, it only helps to keep the reader engaged and guessing. 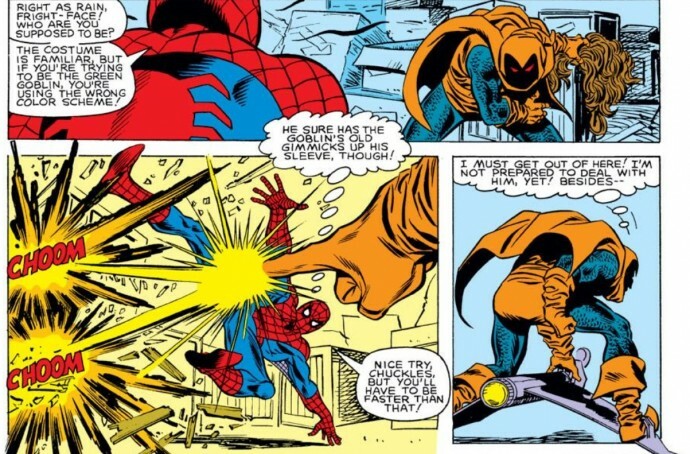 Despite the fact that the Hobgoblin doesn’t think he’s ready for a physical confrontation with Spider-Man, he’s certainly no pushover either. He immediately reaches into the Goblin’s bag of tricks –finger blasts and pumpkin bombs – to knock Spider-Man back on his heels. He then unleashes some razor sharp “bats” at Spider-Man, that totally catch Spidey off-guard. Hobgoblin’s biggest mistake is going for one trick too many. 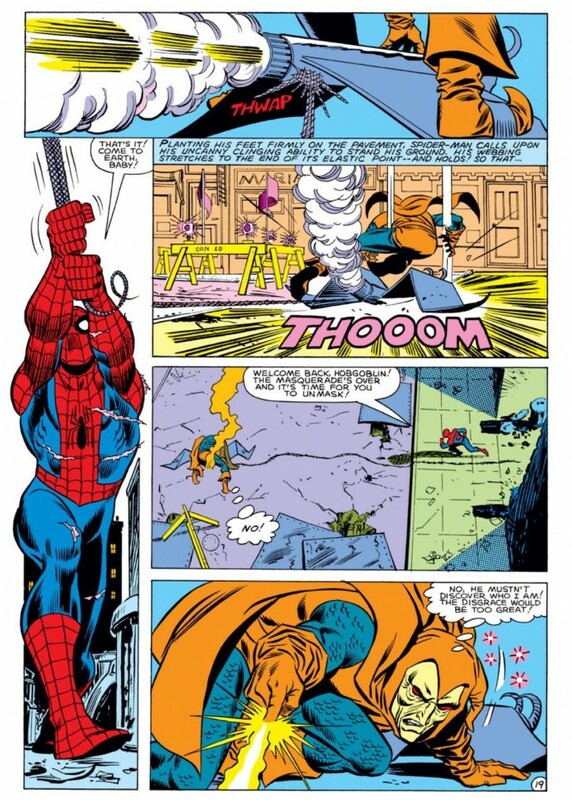 After unleashing one of Green Goblin’s patented gas bombs, Spider-Man is able to uses his senses to navigate through the smoke and snag Hobgoblin’s glider with his webbing and slam him/it to the ground. Stern then drops another clue about the Hobgoblin’s identity. The villain bemoans the fact that he would be “disgraced,” if his identity was exposed at this stage. So now we know that the guy under the mask is either a public figure, or someone of high social standing who is at great political or financial risk if he’s ever exposed as a thief and murderer (I think this definitely tilts the scale in Roderick Kingsley’s favor over Ned Leeds, though I guess an argument could be made that Ned could be “disgraced” as a reporter if he was exposed as the Hobgoblin. Still, I think a wealthy industrialist like Kingsley has much more to lose, especially after the events of the third part of the Original Hobgoblin Saga). In yet another great bit of storytelling, after the Hobgoblin escapes Spider-Man by blowing up a gas line with one of his finger blasters, Stern shows both the hero and villain dejected by the evening’s events. 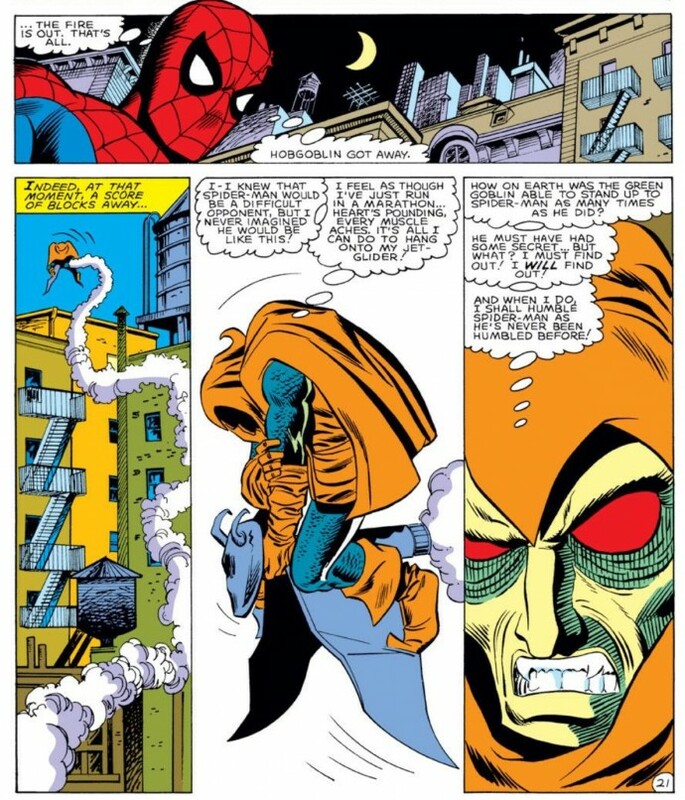 The Hobgoblin is disappointed by the fact that he was physically unprepared to take on an adversary as tough as Spider-Man (which sets-up the second chapter of this arc, which I’ll feature next week), while Spidey is bummed that this new villain was able to get away. Having both characters think the other one was the victor keeps suspense high for the next encounter, which could honestly come at any point given the quirky “the end?” on the last page of the issue. I’ve always loved those Spider-Man stories that ended a specific “arc” but were still a definitive cliffhanger. ASM #239 is not quite Han being frozen in carbonite, but there’s certainly an unsettling feeling to how things end. And the fact that after this grand introduction, Marvel makes us wait five WHOLE issues before we see the Hobgoblin again, was probably torturous for readers in 1983. This is part two of Chasing Amazing’s lookback at the Original Hobgoblin Saga. Next Thursday I’ll discuss Amazing Spider-Man #244. All images from Amazing Spider-Man #239: Roger Stern & John Romita Jr.
Just wanted to say I’m enjoying this Hobgoblin look-back so far, love the blog, I’ll say more when the review of 244 gets posted.